Few manufacturers have as dedicated a following as Kicker. Let's have a look at the brand, their current subwoofer series and a few of their models to find out if they are worth your hard earned cash. Originally founded in 1973, this company quickly became the go-to manufacturer for car audio enthusiasts of every stripe and preference. Mainly though, they have long been the favorite of young bassheads looking to build their first powered subwoofer system for their car stereo. 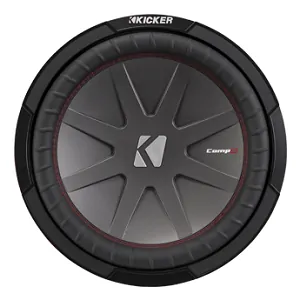 Kicker makes both high end subwoofers that will please even the most discriminating audiophile or competitive basshead, and more affordable economy options that may not have the looks, but still have the signature kicker sound. Let’s take a look at their current lineup, as well as a few reviews some of their top selling subwoofers. 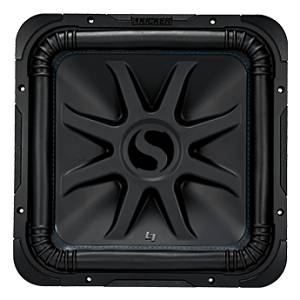 Kicker’s most innovative and powerful lineup of subwoofers belong to the L7 Series. You read that correctly. Square subwoofers. According to researchers at Kicker, a square speaker provides 20% more surface area than a subwoofer of with a cone-shaped diaphragm. Paired with a massive motor and driver, these subs produce some of the most powerful bass available. While they are a pricier premium product, these are definitely groundshakers whether you install the 8”, 10”, 12”, or 15” size. A lot of research, testing and development is clearly evident in the Comp Q design, and these subs throw serious bass with zero distortion and without generating a lot of heat. These subs range in size from 10”-15”, and if you want the best rumbling thunder Kicker has for sale, this is the subwoofer to buy. The Solo-Baric L7S series is intended to bring the additional surface area of a square subwoofer to a more affordable price bracket. It may not use the same materials as its higher end counterpart, but it is still a powerful performance subwoofer that is capable of handling massive wattage while dampening out distortion and maintaining high bass fidelity and clarity. 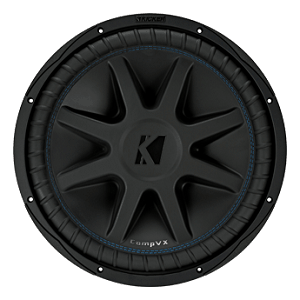 It also has some unique customization options that can be added to the 10” and 12” subwoofers (Sizes range in size from 8”-15” in 2-Ohm and 4-Ohm impedance ) to give your subs as look that is as unique as their sound and design. Looking for some clean sounding subwoofers that don’t run too hot? The CompVX series has you covered. 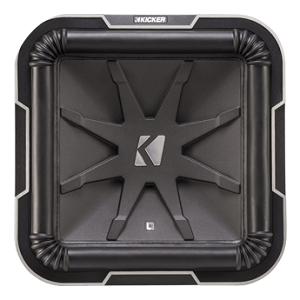 These subwoofers are the upper-middle price point option from Kicker, and offer serious performance that can handle up to 2,000 watts of peak power. 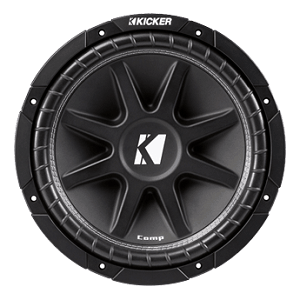 They are a little on the pricey side, but they also produce some of the cleanest, most distinctive bass performance kicker has to offer. Ranging in size from 10”-15”, CompVX subwoofers are essentially a traditional cone version of the Solo-Baric L7S series. You are essentially getting a similar level of performance to the CompQ series priced within a more affordable range than their high end cousins. 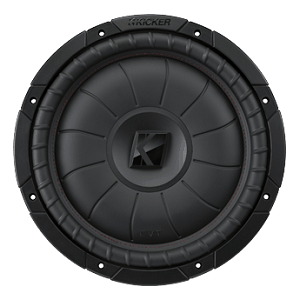 The workhorse of the Kicker product lineup, these subwoofers are reasonably priced and built for performance. They don’t run hot, they sound amazing, and they are great starter subs for any basshead looking to build their first quality sub kit. Need the performance of the CompR line, but short on trunk space? These are the slim-fit version of the popular Comp R line, allowing you to build smaller without sacrificing power or sound. A stylish looking high quality subwoofer that is built specifically for loud, high power systems. 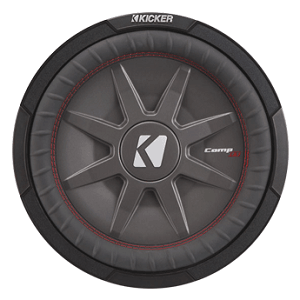 It sports a more powerful magnet and motor than the CompR, allowing it to deliver that signature Kicker thump that typically is reserved for their higher end products. CompVR in a more compact, flatter mounting package Still handles massive amounts of wattage, just takes up less space without sacrificing sound quality or overall heat dissipation. A favorite of bassheads just getting started with their first subwoofer system, the Comp C line is for those who crave that thunderous thump but have a limited budget to work with. 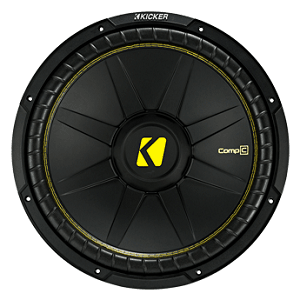 Rather than their patented Solo-Kon cone material, these subs use polypropylene and have the signature yellow stitching and logo that has made Kicker a household name in the car audio world. 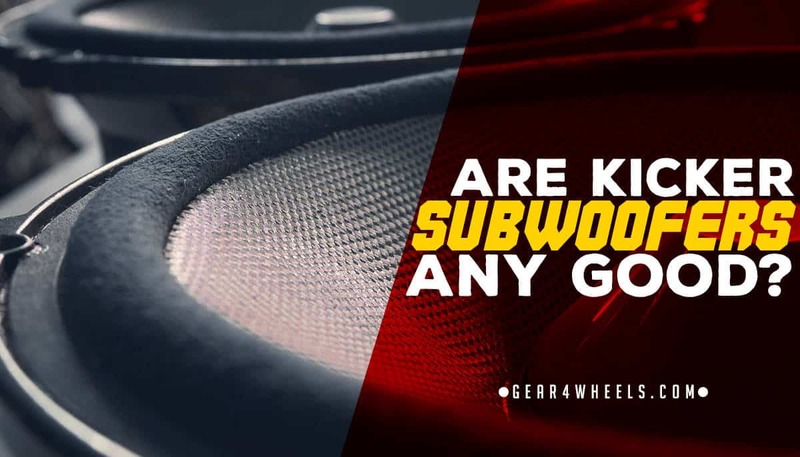 While these subwoofers aren’t going to win any bass competitions outside the amateur circuit on the block, these subs are more than enough to get any bass-happy car audio enthusiast started on building their dream system. Are you a one of those car stereo system builders that care more about sound than looks? The Kicker Comp line is for you. These subwoofers offer the the power performance of the Comp C line at an even more affordable price. What they lack in cosmetic and aesthetic appeal they definitely make up for in overall “oomph”, so if you are trunk mounting a bass box that no one will be looking at, these Comp series subwoofers are both versatile and potent enough to satisfy anyone’s craving for bass. These are big square subs for big sound driven by big amps. If money is no object and you want as much power as you can cram into a subwoofer, these squared 15” subs will do the trick. They made into our list of the best 15 inch subwoofers for a good reason. The power handling of these subwoofers is astonishing, and the squared speaker surface feels like it gives your bass some additional kick you just don’t hear from traditionally designed subs. Square speakers also tend to mount more seamlessly and are easier to work with when building your own custom box. These subs do sport a 4-ohm impedance, which can mean higher heat generation than their 2-Ohm counterparts. These subs run fairly cool, but if you are looking for optimal impedance performance, go with the 2-ohm options. Impedance is 4 ohms as opposed to a more efficient 2 ohms. These subs are ideal for anyone that wants premium bass performance at lower power levels. Clarity and bass frequency response are exceptional even at low volume, giving your music’s low end some dynamic punch typically lacking in low volume play. If you are looking to throw some bass without paying the premium price of competition grade subwoofers, these subs make a good compromise between pro-level power and high-end sound and materials. In terms of raw power, these subs are not necessarily going to bring the noise like Kicker’s higher end L7 and CompQ line. They are great subs, but they may not give quite as much thump as you anticipate if you are looking for something to shake the block. High build quality in a more affordable package. A compact subwoofer with excellent performance that won’t break the bank. This is an ideal starter sub for a single or dual-subwoofer kit. 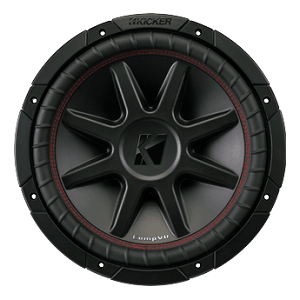 Make sure to check our list of the best 10 inch subwoofers to see a lot more options on this size. Even at 350-watts, this little sub can really deliver some decent punch in the lower register. While they are great for their size, these little subwoofers are not going to rock the block or do much earth moving. They sound fantastic, but they don’t really crank up that high even when powered by a strong amplifier. Great for a strong in-car bass experience, but not so much on the outdoor sound system capabilities. Not particularly loud, though they do provide decent in-car audio performance. Want that high-end sound with some more customization options? You definitely need to check out these 12” square subs from Kicker. With multiple grille and illumination styles, these subs stand out from the crowd with more than just their shape. 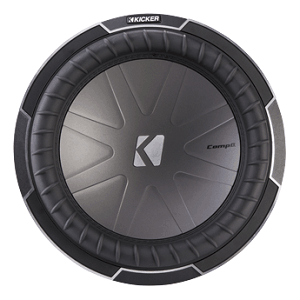 As much power as you could want from a square 12” subwoofer, with high quality, distortion-free bass to go with it. Add to that the customizations that you can add to this subwoofer to make your kit stand out when you are showing it off, and you have one exceptional value for a bass performance kit that really brings the thunder. The cone construction of these subs is not the top quality material that is used in the higher end L7 product line, so they may lack some of the crispness that one might expect from a premium subwoofer product. They also have a less-efficient 4-ohm impedance, so they are likely to generate a little more heat. Higher impedance means this sub tends to run hotter in enclosures.